In Illinois, it gets hot, hot hot in the summertime, and without an air conditioner that works as hard as you do, temperatures can be more than just uncomfortable; they can be downright dangerous. At Van Drunen Heating and Air Conditioning, our team cares about keeping your family cool when the sun is beating down, and offers the best in AC installation services in Illinois. There are a variety of problems that can cause your air conditioning unit to break down and fail to function properly. While many of these problems can be prevented with basic maintenance (which our team is happy to perform!) or corrected with easy repairs (we can do that, too! ), sometimes, the best solution to a broken air conditioner is new AC installation. Your air conditioner unit costs you too much money to run because it is not energy-efficient. 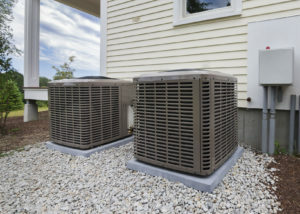 The last consideration is a very important one; while many homeowners understand that they need to install a new AC system when things are broken, they don’t consider installation in order to correct energy inefficiency. However, the U.S. Department of Energy reports that AC use costs American homeowners about $29 billion per year, and uses about six percent of all energy used in the United States. By upgrading your air conditioner to a new, energy-efficient unit, you may be able to cut energy use by between 20 and 50 percent! This translates directly to more cash in your pocket. What’s more, once your air conditioner is installed, we can also provide routine maintenance when your unit needs it, as well as repairs if something goes wrong. We want to be your go-to for all your air conditioning needs in the summer, and all of your heating needs in the winter. We are here to serve you, and care about your experience and customer service the way all great companies should. If you have a questions or want to learn more, just contact us today at 708-339-6444. You can also write us a message using the online form found on our website.